Originally grown in Morocco, medjool dates offer a sweeter and softer alternative to deglet noor dates, the variety of date most abundantly grown in California. Though they pack a heft caloric punch -- a serving of just three dates contains 199 calories -- medjool dates also have minerals, vitamins and fiber that boost their nutritional value. Use medjool dates in recipes, or eat them on their own for a healthy snack. Almost all of these calories -- 99 percent -- come from carbohydrates, and each serving of medjool dates ups your carbohydrate intake by 54 grams. Because your brain and muscles use carbohydrates as fuel, medjool dates help promote these tissues' functions. A serving of dates also contains 4.8 grams of dietary fiber, which works to control your blood cholesterol levels and move food through your digestive tract. The fiber in a serving of dates contributes 13 percent toward the daily needs for men and 19 percent for women. Snack on medjool dates as a source of vitamins B-6 and B-5. Together with the other B-complex vitamins, vitamins B-5 and B-6 maintain the health of your skin and hair while supporting liver function. Vitamin B-6 also helps you produce brain chemicals essential for mood regulation, while vitamin B-5 plays a role in red blood cell development. Each serving of medjool dates contains 580 micrograms of vitamin B-5 and 179 micrograms of vitamin B-6. This makes up 11 percent and 14 percent of your daily B-5 and B-6 intake requirements, respectively. Medjool dates also provide you with potassium and copper. Both minerals contribute to the health of your cardiovascular system because copper supports collagen synthesis -- a process needed to keep your blood vessels strong -- while potassium plays a crucial role in heart function. The copper in medjool dates also aids in energy production, which helps ensure your tissues have access to the fuel they need to function. 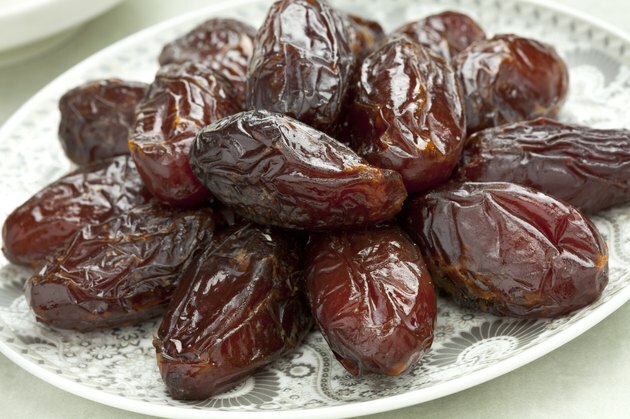 Each three-date serving of medjool dates offers 261 micrograms of copper and 501 milligrams of potassium -- 29 percent and 11 percent of your daily copper and potassium needs, respectively. Medjool dates don't require refrigeration and stand up well to travel, so they work well as a snack to eat on the go. Their natural sweetness and complex, caramel-like flavor can help satisfy your sweet tooth without turning to baked goods or sweets. Combine chopped dates with apples, arugula and low-fat Gouda in a whole-wheat wrap for a nutrient-packed lunch, or branch out in the kitchen by braising chicken in a mixture of apple cider, chopped medjool dates and warming spices, such as cardamom, cumin and turmeric.